If you’ve ever thought the iron in your hotel room smelled odd or found bottles of shampoo in the mini-bar, perhaps George Egg has been there before you. George is a stand-up comedian who spends half his life on the road (just look at the list of dates on his website) and far too much time for his liking in hotel rooms. Being a lover of fine food too, he’s got pretty fed up with arriving back late after a gig to find that the only sources of food are the night porter with the room service menu or the late night supermarket. So it is that he’s devised countless ways to rustle up something tasty with what he can find in the hotel room and a few items picked up on the way back. 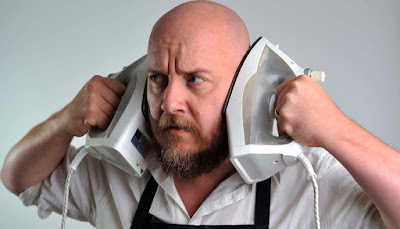 George’s love of good away-from-home cooking meets stand-up in his show “Anarchist Cook” which hit Liverpool’s Unity this week after returning from a stint in New Zealand via London and Norway. Part comedy gig, part demonstration, it’s hard to pigeon-hole this show, which is a feast for all the senses. In the space of roughly 80 minutes he rustles up a three course meal using a selection of simple ingredients, rather a lot of those little UHT milks and some forage from the hotel lobby. All cooked with appliances such as the iron, the kettle and the mini-bar fridge, the results look and taste good, being presented to the audience to sample at the end of the show. From home made cheese (really) to poached sea bream and fluffy pancakes, everything is done pretty much to perfection. Coming to the end of the evening you’re left wondering whether you just dreamed it or did he really just do that, whilst delivering some great observational humour. Not only does he demonstrate the three courses that he presents on stage, he also throws in numerous other recipe tips, including a method for curing homemade salami that boggles the mind. You can even buy recipe cards at the end. I can’t say I’d recommend trying this in the next Premier Inn you stop in, unless you don’t mind a surcharge, or using your own iron at home like this but the recipes do adapt for preparation with more conventional equipment. George isn’t the tidiest of cooks (there’s a dreadful mess on the floor) but he has impressive knife skills to go with his infectious sense of humour. Anarchist Cook is a cross between Saturday Kitchen and the Tommy Cooper Show, and well worth a visit if you find it hitting a venue near you.